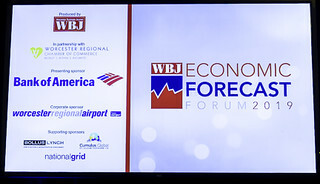 Thank you to all of our speakers, sponsors, and everyone who attended our annual Economic Forecast Forum! This special annual event produced by the Worcester Business Journal in partnership with the Worcester Regional Chamber of Commerce features top industry leaders who will put today’s trends and top issues into perspective, share their insights, address the top economic issues facing our region, opportunities for further expansion and headwinds that could stand in the way of that growth. Many industries are experiencing disruption in the form of new technologies, non-traditional competitors and consolidation. Depending on where you sit, disruption can be a threat, an opportunity or both. While sea change in any industry can become a threat to established players, it can also sharpen competition and push positive transformation. In this annual forum we’ll hear from a leading economist and industry leaders on the cutting edge of change and learn how they see the future and are driving transformation in their organizations. Leaders from different industries will discuss the pace of change, the future outlook, and share how they have responded to disruption and driven innovation in their organizations. *Update: due to circumstances beyond our control, previously confirmed panelist, David Rosenberg of Prime Motor Group is unable to participate.